the introduction of nanotechnologies could threaten markets for goods from developing countries, according to a presentation made at the recently held fourth World Conference of Science Journalists. The presentation was made by Pat Mooney, executive director of the etc g roup--a Canadian organisation that studies the socio-economic impacts of new technologies. As per Mooney, use of nanotechnologies in Northern countries will affect the agricultural and industrial products from developing nations in many ways. For example, application of nanotechnology in uscotton farms to increase production will reduce markets for cotton from China, India and West Africa. 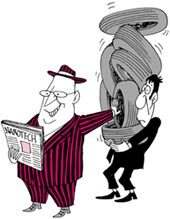 Rubber tree producers in Malaysia and elsewhere, who are planting trees now in anticipation of harvests in 10-15 years, will be in financial trouble because of nanotechnologies that could make tyres that last longer than cars or even their drivers. Likewise, while Bolivia is being encouraged to dig more mines, multinational mining companies are exploring nanotechnologies that will allow them to recycle minerals. Mooney also warned of intellectual property issues, saying "it is 'Wild West' in terms of the patent system". He called for a un convention to evaluate the impacts of technologies, not only on human health and environs but also on society at large. "Any new technology introduced in an unjust society will exacerbate the gap between rich and poor," said Mooney.